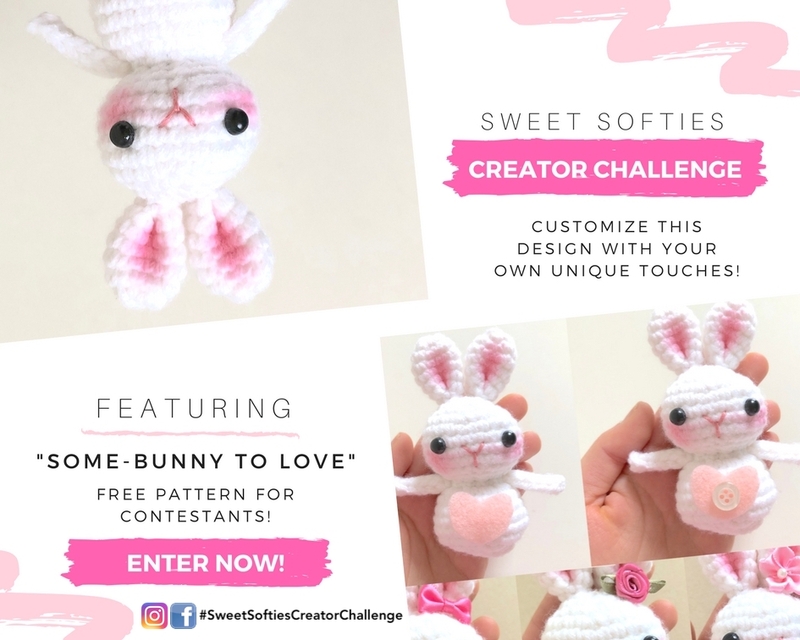 Welcome to Sweet Softies' very first Creator Challenge, featuring the design: Some-Bunny to Love! A Creator Challenge is an event where crocheters can enter to: (1) receive free PDF copies of the crochet pattern, (2) complete the project, and (3) customize their creations however they'd like! It's like a crochet-a-long (CAL), but crocheters are encouraged to add their own unique flair to finish the doll. All submissions will be shown on my website, and one will be handpicked by me for a prize! If you'd like to make this cute bunny using the free written pattern on my blog, please click here. To enter this challenge, complete the short sign-up form here by March 14th, 11:59pm PST. After signing up, you will receive the pattern file on March 15th. You must follow the pattern stitches and rows exactly as they are written. You may change the yarn color used. You may add any embellishments you'd like. You may submit as many entries as you'd like. Entries must be submitted by the end of this month: March 31, 2018 at 11:59pm PST. Note: Your entry will not count unless it has the tag! The winner will receive a free Twee Toys pattern of their choosing! The Twee Toys Collectible Series includes: Ginger the Giraffe, Fletcher the Fox, Brennan the Bear, Remi the Rabbit, Dawson the Deer, Farley the Fox, and Finley the Fox. Update [04.03.2018]: Results are in! Click here to view all the lovely, finished bunnies from this creator challenge! Thank you so much for reading, and I hope you'll join in on this fun Creator Challenge!